It was the 15th November 1958 and a thick fog had descended along the Eastern Scottish coastline. Visibility at St Abbs Head, Berwickshire was very poor, hiding the rugged, rocky shoreline and the Meg Watson Rocks to the north of the headland. The MV Nyon a Swiss registered Merchantman (4956 tons) was making her way to Dakar with a crew of 33 on board, after discharging her cargo of grain at Leith. At approximately 7pm and up to 3 miles from the normal shipping route, the Nyon went aground on to the Meg Watson Rocks. She lay with her bow between two rocky points less than 100 yards from the shore which rises steeply in a cliff face to 150 feet. Nyon sat fast, in a perilous position, with massive damage to her underside, as emergency services erected a breeches buoy reaching from the top of the cliff to the vessel 150 feet below. Charles had been immediately dispatched to St. Abbs and was watching the drama unfold. Always the one for a unique picture he had found himself a position at the very edge of the cliff and began carrying out his duties recording the courageous efforts of the coastguards as they attempted a rescue. It was at this point things began to go horribly wrong, not for the crew of the Nyon who it was decided were safer staying on board and attempting a repair to the ship’s hull. Nor for the rescuers whose professionalism and bravery was beginning to pay off; but for Charles. Dad was never quite sure what happened next. Whether it was the ground breaking away beneath him or a clumsily placed foot, the result was the same, he began to fall down the sheer cliff face. Charles’ next recollection was of coming round in immense pain and perched on a small ledge about twenty feet from the top of the cliff. This short and narrow ledge had stopped the otherwise inevitable plunge to the rocks 150 feet below. The exact details of his rescue have sadly been lost in time albeit to say that two of his fellow news photographers bundled him into a press car and rushed him to hospital in Glasgow for emergency treatment. It was a year later that Charles was finally allowed to escape the confines of a plaster cast that covered most of his body and was able to return to his newsreel work. Charles was repaired and returned to his duties – but what of the MV Nyon? Attempts to plug the holes in the vessel with cement and then to pull her off the rocks with four tugs had failed. She was stuck fast and badly damaged so it was decided to cut her in half and save the aft section, then after removing anything of value, leaving the rest to the sea. On the 27th November, after a number of failed attempts and the use of cutting equipment and small explosive charges the aft section came away and was towed by tugs to North Shields. A short time later the front section broke up in a winter storm. The ships owners quickly contracted a Dutch ship yard to build a new front section and to then join the two parts together. By mid-1959 the job was complete and Nyon set out on trials. So there was to be a happy ending after all. No unfortunately not. 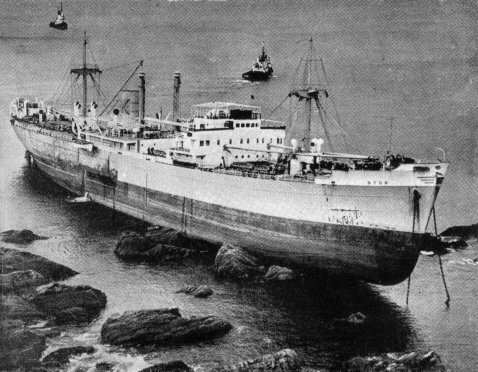 MV Nyon plied her trade until 15th June 1962 when on a trip to Montreal from Antwerp, in thick fog and just five miles off Beachy Head she collided with an Indian cargo ship M.S Jalazad and was lost. Previous PostCameronLife at Handel and Hendrix London.